That’s why a thoughtful strategy for distributing and promoting your content is essential. This can include email promotions, paid advertising, social outreach, and so on. But your website is the single most important tool for promoting your content. The problem is: where do you put all your content? In the “old days” before the content marketing explosion, this was much easier – you could simply list a few whitepapers on a webpage and be done. But today, if you’re not careful you’ll end up with various kinds of content scattered all over your website. What should you do with all those recorded webinars, ebooks, guides, slideshares, infographics, third party content such as analyst reports, and so on? This is exactly where a content resource center comes in. A content resource center is a section of your website where you can organize and publish your content in a way that makes it easy to find and share the content they need. It enables customers and prospects to easily find the information they seek. It encourages serendipitous discovery of content. When prospects look on your resource page for one product line or in a particular market segment, they may also notice content that addresses other questions they have. It increases “stickiness” of your website. Customers are more likely to stay and browse when visiting a resource center because they know where to return to find updated content. It helps spread your influence. When content is easy to find and interconnected, people are more likely to share your links and recommend your content to their colleagues and clients. I would add that a good resource center should serve as the hub of all your inbound marketing efforts. Done well it can support your search engine optimization and social media efforts, as well as your lead generation / website conversion efforts. Here are a few examples of companies with resource centers that I admire–not surprisingly, they’re all companies that excel at content marketing. 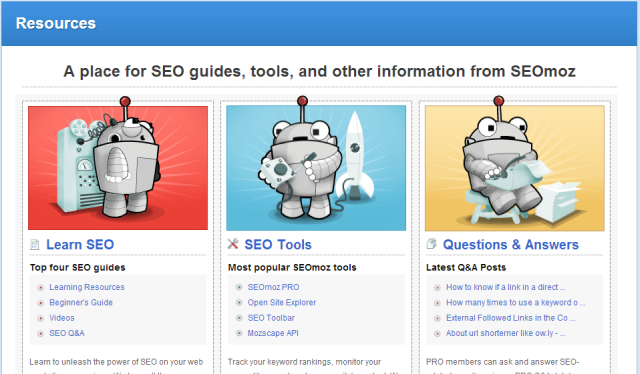 SEOmoz provides SEO software, hosts a vibrant SEO community, and provides amazing content. The SEOmoz resource center takes a broad approach. Instead of only hosting thought leadership content, they combine educational content for learning SEO with links to some of their actual software tools, as well as links to their community. I love how the visual design, incorporating their signature robot, conveys personality to the brand. There’s so many great attributes about this site once you get into some of the specific sections, but one thing I’ll call out explicitly is how their resources are all very focused on a single key theme: learning SEO. As a result, they’ve become the destination on the web for that topic. Velocity is a B2B marketing agency, with a specialty in content marketing. Like all their work, Velocity’s Ideas and Insights center is visually appealing. 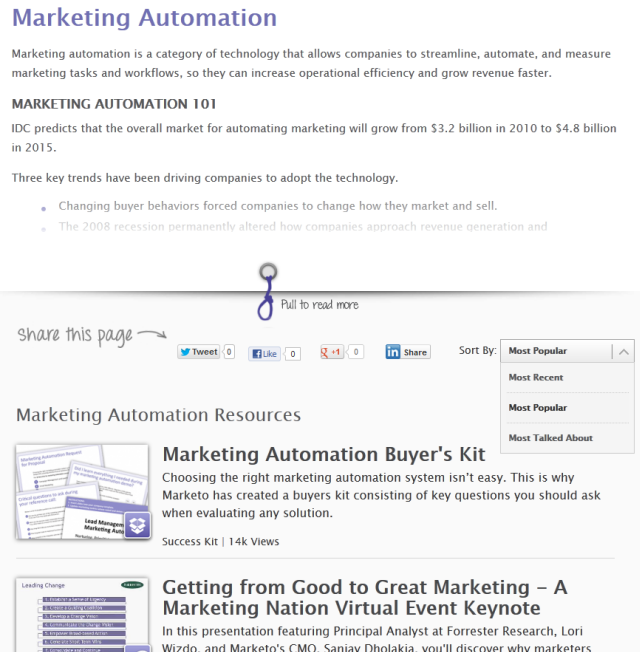 They highlight their best content up top, and even include their recent blog posts near the bottom of the page. On individual posts (such as this one) they do a nice job with social proof and third-party validation, including quotes from experts, social shares with counts, and comments. 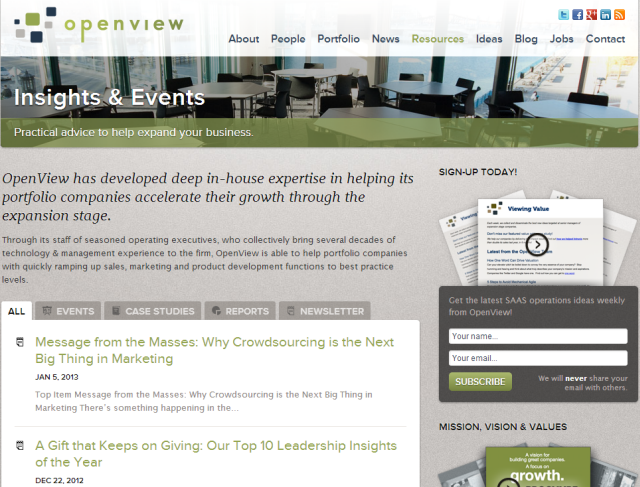 OpenView Venture Partners is a venture capital firm that has truly embraced content marketing. Their resource center provides an easy-to-navigate list of events, case studies, and reports. You can also easily subscribe to their newsletter and access their newsletter archive. 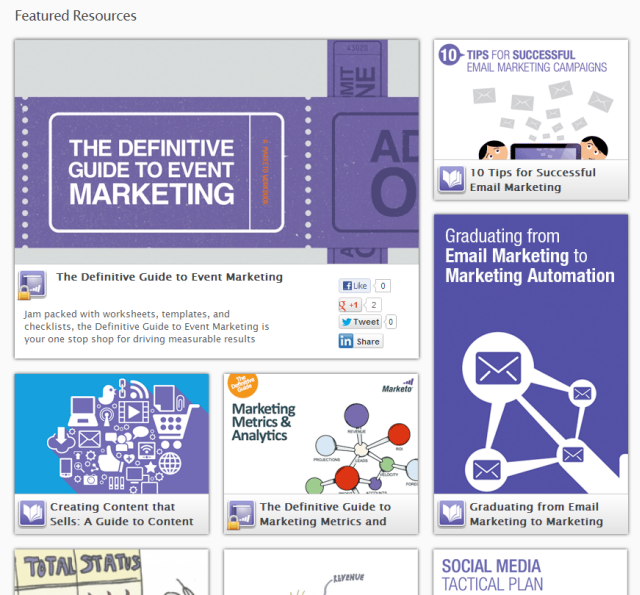 Like many companies (including Marketo), they don’t include their excellent blog in the resource center. One interesting thing is that OpenView Labs, the operational consulting arm of the VC firm, also has a blog which they use as a Resource Center. The blog approach can be useful because it displays the resources in a familiar chronological way. However, I personally find it less effective as a true resource center since it favors the recent content making content discovery more difficult. 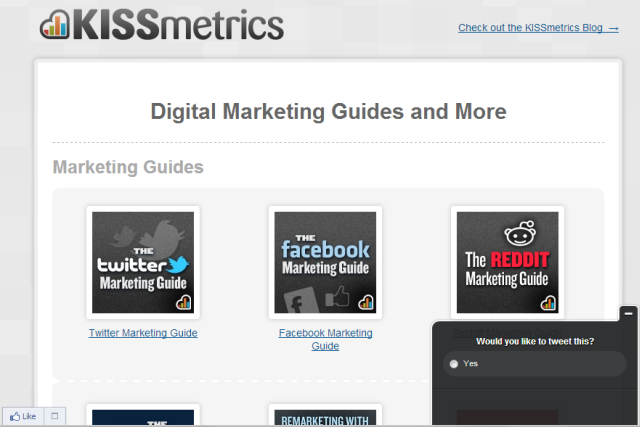 KISSMetrics is a customer web analytics solution. Their resource center is clean, easy to navigate, and visually appealing. 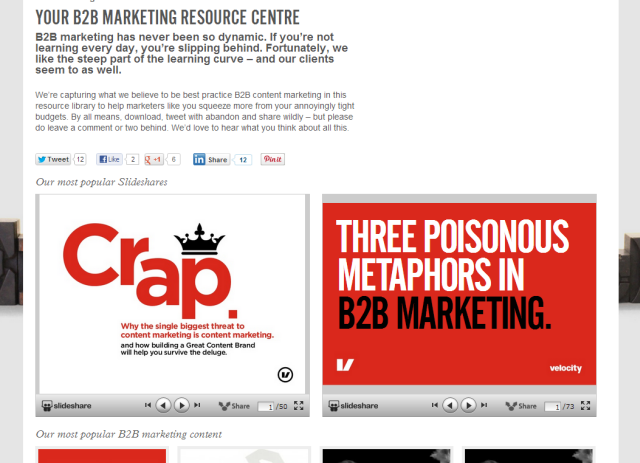 It’s a little hard to find from their homepage, but is nicely integrated into their blog navigation. Another thing I like about their resource center and blog is that they use a very consistent and well-branded visual style for all their “hero shots”, e.g. the picture to represent each guide. 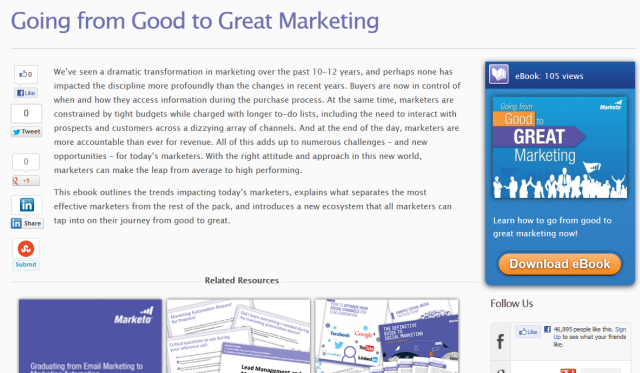 They also have the page well optimized for search around the term “marketing guides”. 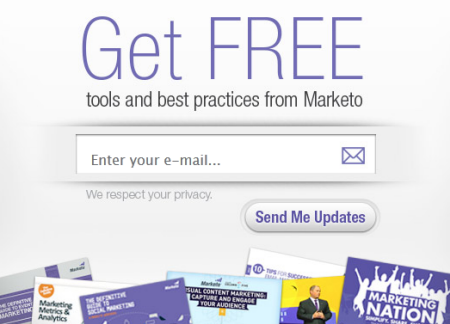 My last example is one that I’m particularly fond of: Marketo’s all new marketing content resource center. We’ve long had an online destination to host all our thought leadership assets, and it has served us well for many years. In fact, our old resource center was even featured in Ann Handley and C.C. Chapman’s book Content Rules (page 179)! Today, we released a major upgrade to the resource center. Here are some of the features we built into it, and why. The main Resources home page features a prominent search box. As our content library grew to over 400 assets, we realized that we needed to move from a “browse” model to a “search” model. So, we created a design to make it easy for a visitor to type in any topic and easily find the most relevant assets. At the same time, we wanted to give new visitors some guidance about the best topics, so we also included a set of links to the most popular types of content and categories of information. It’s a visual world, so we wanted to create an attractive, engaging way to feature our top content. Guided by sites such as LinkedIn Today, Mashable, and the Chrome Web Store, we created a set of tiles that inspire the visitor to browse and explore; moving the mouse over any tile gives a deeper description as well as social sharing links and counts. Most resource centers organize their content by the kind of asset: whitepapers, webinars, ebooks, infographics and so on. One of Marketo’s innovations in our resource center is that the primary organization is around topic and keyword. This helps our customers, since typically a visitor is searching for information about a topic, not a type of information. Visitors don’t say “I want to download a whitepaper”, they say “I want information about marketing automation”. And it helps our SEO, since we get content-rich pages that can attract links and shares. New in this redesign is the ability to place rich, long-form content about the topic on the page, so a visitor can learn about their topic of interest right up top; this makes the page even more authoritative as well. Note that we also have pages for each asset type (e.g. here’s the one for all our marketing ebooks). But the category-based organization is primary. Also note that we focus our resource center on early- and mid-stage content, so our resource center doesn’t have late-stage content such as customer case studies (yet). Rather than just linking directly to each underlying resource (PDF, video, SlideShare, etc. ), we created a page for each one. 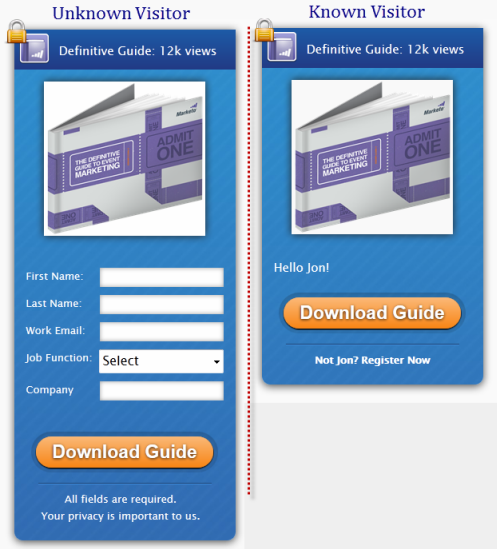 This gives us a friendly, optimized page for each resource, encourages sharing of individual resources, and lets us provide the user with additional information before they decide to download. It also lets us link to additional related resources, which can help the prospect continue to their research (and in some cases, help encourage an anonymous visitor to convert). The majority of Marketo’s content assets are ungated, meaning there is no form-fill-out required to view or download the asset. This is important since putting a form in front of your content can seriously reduce the number of people who will read it, share it, or link to it. On the other hand, sometimes we have Premium content that we want to use to convert leads. Typically, this is either mid-stage content, like an analyst report or buyer’s guide, or one of our flagship Definitive Guides. On our site, they are always marked with a lock icon. However, even in those cases we don’t want to put a registration form in front of visitors that we already know are in our database. So, we’ve built intelligent forms that make a call to the Marketo API to determine whether we have contact information for a visitor. If we do not, they see a form (shown on the left above) and need to fill it out to get the premium asset; if we do have contact information, we simply say hello and let them download the asset with a single click. Pretty cool, huh? Since so much of our content is ungated, we wanted to find a way to use the resource center as a whole to build our mailing list, so we could nurture relationships with prospects over time. Taking a cue from some of the best content marketer’s out there, including MarketingProfs and the Content Marketing Institute, we are testing various ways to capture opt-in signups using only an email address. Along with capturing Likes and Follows, this will be an increasingly important way to connect with early stage buyers who may not be ready to commit to a full registration. I’d like to say thank you to everyone who helped design and build this site, including Davis Lee, Lynn-Kai Chao, Glen Lipka, and Carina Boo from Marketo for design and user experience (plus some feedback from Bryan & Jeffrey Eisenberg); Nathan Brauer and Mikel Ward from Marketo and everyone from Adair Creative for development; Jeff Cowan for project management; and Dayna Rothman for managing all the content. What do you think? Do you love the new resource center? Hate it? It’s still new, so let us know how else we can make it even more awesome.